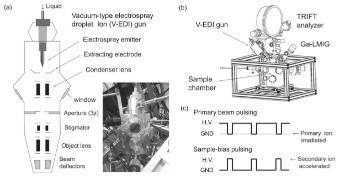 We have developed a vacuum-type electrospray droplet ion (V-EDI) gun as a novel massive cluster beam for surface analysis instruments in which the beam source is a vacuum electrospray of aqueous solution. The prototype of the V-EDI gun was connected to a time-of-flight analyzer. Secondary ion spectra produced by the V-EDI beams were measured using a sample-bias pulsing method, because a short pulse of the beam could not be obtained. The secondary ion yields of biomolecular samples produced by the V-EDI and Bi cluster ion beams were compared, and the secondary ion yields produced with the V-EDI beams were found to be much higher than those produced with the Bi cluster ion beams.